These rings—each equipped with its own gorgeous gem—stack gracefully whatever shape they take. There's no "right" way to wear this set of five stacking rings with striking stones attached. Although held together by a thin strip of brass, they're still mobile—free to spin and rearrange as you wish, stacking gracefully whatever shape they take. 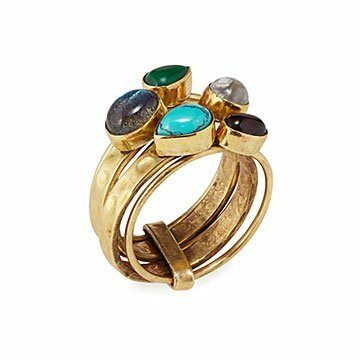 With two textured brass rings and three ultrathin specimens each equipped with its own gorgeous gem (like moonstone, garnet, or malachite), this ring is the ultimate in eclectic style. And did we mention its materials are ethically sourced? Handmade by artisans in India (as if you needed another reason to love it). Run under hot water and use fingers or soft bristled toothbrush to lightly scrub. This is a beautiful and unique piece. I never wear it without getting a compliment. I find myself planning outfits around it!